Rüppell's Parrot (Poicephalus rueppelli) populations may be in decline due to unsustainable levels of trade. 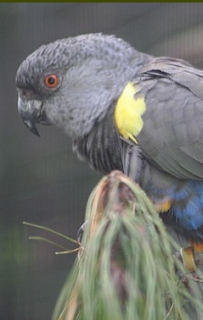 Project and progress: In 1996 the Canadian World Parrot Trust supported researcher Richard Selman from the University of Natal in his research on Rüppell's Parrot in Namibia. A study of dietary and nesting requirements in N Namibia was done in 1996 and 1997, and various years in the 2000s. Outcome: The Namibian Red Data book Near-threatened classification highlights the species' conservation status in Namibia and the need for further attention from conservation bodies. In 2012 the second Southern African Bird Atlas Project was begun to provide current information on distribution and range and population changes through comparisons with the first Atlas of Southern African birds (Simmons et al. 1997). Where found: N Namibia and S Angola. History: In 1995 the Namibian population was estimated by Robertson et al. (1995) to be just under 10,000. This estimate was later revised upward to almost 30,000 (Jarvis and Robertson 1999). This estimate remains the most recent on record with no numbers yet for Angola. Since the 1980s flock sizes have been reducing, with the entire population thought to be in decline. Due to their restricted range and suspected decline they are recognised as Near threatened in the 2012 Namibian Red data book (Simmons 2012). South Africa has been the largest exporter of this species, with 7175 birds being traded from 1994 to 2010 (UNEP-WCMC). Ecology: Rüppell's Parrots are found in woodlands along dried riverbeds, dry woodlands, dry steppe and thornveld, areas with tall trees, up to 1250m (4100 ft). Birds eat various parts of plants - buds, shoots, nectar, flowers, seeds, pods, fruit; also melon and insect larvae. They generally stay near water in small flocks up to 20 birds; in seen in greater numbers where food plentiful. Breeding may be more linked to rainfall than season.